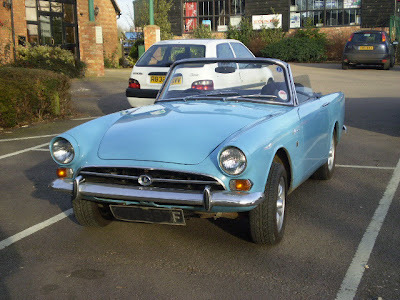 Adrian P provided this great snap of a lovely Sunbeam Alpine parked a mile or two down the road. If the owner happens to spot this and wants a good home for it then I'd be more than a little interested. And he or she doesn't have to look like Ria Bartok. It surely won't be long before we choose another song to do battle with Eastern Europe with. Before that maybe I should apologise profusely for last year. Thought I'd kept it secret but, of all places, Moldova have let the cat out of the bag. Bryony's 11 going on 17 and the first parents' evening at her new school is tomorrow. "Are you going?" she asked. Before I got a chance to reply she'd added: "My friends'll be there." "Oh good." I said. It is only from classmates that you can ever really get an accurate idea of how your child is doing at school. The teachers may tell you what targets they may or not have met and will be either glowing in praise or rage depending upon whether Bryony was brave enough to risk not being cool by actually answering some questions in the last class or regarded as the ring-leader in some chaos-creating wheeze from which they're still regretting the phasing out of caning respectively. My getting a more realistic assessment of her progress was not what my daughter had in mind. "They sell stuff in the shops for those grey bits," she announced looking at my hair. "And you'll need to do something about those bits," she went on, meaning my eyebrows which have rather become like weeds in a January hedgerow. I hadn't appreciated just how peppered my mane had become, though, and a quick glance in the mirror revealed that the ravages of time had taken its toll on the old brown locks too. I'd only noticed the bits near the temples which I remember reading in some women's magazine some years ago was regarded as pretty acceptable. "I'll see what I can do." I promised, thinking that I might be able to get away with a few flicks of a dark brown felt-tip and some judicious pruning. "OK," she said, "see you at 4:30, and please don't be embarrassing, Dad." She was clearly quite worried about the first impression I was going to make on her friends and I imagined some kind of rating panel they conducted afterwards which would determine who would continue to be friends with whom thereafter. It was quite a relief not to have to worry about what she thought the teachers might say, at any rate, but whilst I could handle whatever they might dish out in the allotted five minutes I have to admit that I was now extremely nervous about being voted number one Uncool Dad, Nerd, Oldie or Weirdo by the 7A girls. The only shop open on Sunday was Tescos but I managed to locate something that appeared to be what I wanted. Easy to apply said the box. Get rid of grey in less than 5 minutes. The illustrations appeared to show some hunk in a shower painting his hair and it looked simple enough so I bought one. Later in the day I took a good long look at those strands that were causing all the trouble and began to think that they weren't that bad after all. I mean, it's not as if all my students were pointing and giggling at me or whatever and there are some pretty blunt colleagues in the staff room with considerable more aged locks than mine who'd be bound to want to zap me with a few choice remarks if it was that obvious. I started to have second thoughts. "No," I thought, " I did promise. Let's get on with it." So off I went to the bathroom and got out the bottle. "Ah, two bottles . . . and a leaflet . . . better read it." I don't recall ever reading quite so many warnings and dos and don'ts in one small leaflet. Enough to put anyone off but I pressed on. "My God, gloves!" I said and then had to go and get a clock to time how long the stuff had to stay on for, duly observing the dire warning about not trying to guess five minutes and going too dark. I do take issue with the Easy to apply label and they might have included something about needing to redecorate the bathroom afterwards and not to be too taken aback at the apparent change of skin colour that also takes place during the exceedingly messy process. However, the job got done, although I did panic after about three minutes, worrying that I'd turn into a liquorice allsort if I didn't start rinsing soon. I'm now checking the colour every few minutes in a mirror as I write this. It does seem to have worked but just how dark is it compared to before? Will it be obvious? I think I'll have to go and pretend to borrow a tin opener or something from next door and try and judge their expression. The things Dads do for daughters. She sure had better give me a nudge and say "That's OK, now, thanks," or something similar when I get there and I shall have to try very very hard not to tell her friends the story! Well not until I've been voted at least a little bit cool first. Love the film but that's another story. This is just to record an encounter with two dance floors in one day, a surfeit of chocolate and the inevitable music and laughter accompaniment. The day started with a manic run to Dunstable at 7am for no reason other than my strange sense of duty and some belief that if a student turned up it would be more honourable for me to tell him or her that I'm heading East at 10:30 than their merely reading the post-it on the door. No-one did, of course, so it was M1 A1 and various other rain-soaked roads to help my brother extract my mum from a care home. Overtaking lorries through a haze of spray was the sort of thing that you wouldn't do if you really thought hard about it. I mean, you just assume that the lorry's lane and yours will run in parallel for long enough to get by and that there's not some massive puddle lurking in your lane further on. Job done, we were in need of refreshment and landed up in an inn in Whittlesey situated somewhere that you wouldn't ever go unless you were quite lost, as we were. Sauntered in through an open door and found ourselves on one of those wooden dance floors that I remembered from the 70s. Probably hadn't been on one since. "Look, there's even a glitterball!" I yelled. My brother didn't quite appreciate my enthusiasm but smiled before shaking his head and concentrating on the more important matter of finding the ruddy bar. Now, normally a Friday lunch of the size that arrived would have been great news and enable me to cope with Saturday without any trouble or concern for breakfast. Just as I was finishing the last delicious bit of sea food and feeling decidedly warmer, I remembered that there was something called a candle-lit dinner chez Sarah & Adrian for several village inhabitants. One should not be fooled by either candle or lit. That may sound compact but I suspected that there wouldn't be room for the word lit even in a very very small font on the table, assuming that we ever made it through the mass of nibbles and aperitifs. Made it home through ridiculous quantities of rain along the A14, A45 et al just in time to try and figure out what to take along and to change into some slightly drier clothes and trousers with room for expansion. Great evening, apart from James Blunt wailing from a nearby speaker for a while but soon changed that to something else. In fact, I had a sudden and quite inexplicable urge to hear Paul Simon's The Only Living Boy In New York and managed to persuade Adrian to dig it out of his vast CD collection. The meal was vast and yummy but what has to be mentioned is the dessert. Two of the ladies had spent a considerable time in the kitchen and the fruits of their labours were simply massive bowls of ice cream, cream, rich, sweet sauces and chocolate galore. I mean if it hadn't been a warm sauce I declare that the whole dish would have solidified into a giant toblerone or elephantine chocolate fudge. It was delicious but I felt like apologising to my stomach for the space it was occupying down there. Despite the weight and displacement inevitably brought on by the chocolate collision (as I feel it might be aptly named) two ladies decided to started twirling on the dance floor as the evening progressed . . . did I say dance floor? Yes, the house was, indeed, floored with almost exactly the same wood as the Whittlesey inn of earlier that day. Amazing. It also snowed that night. I woke up Saturday morning, turned on the radio just to check that it was Saurday and that it was morning still and this totally enchanting track was being played. 60s, French, female. Reminded me of Chocolat. Just had to find out who it was and discovered it was someone called Ria Bartok. Totally hooked now. The previous post has a grainy video. It's my latest craze. The 943rd meeting of the Paddock Party Committee was held at a number of venues on 1 January 2008. This wasn't as a direct result of the Committee being unable to agree where to meet at the last meeting but more a matter of members agreeing to meet in different places. It helps if you're somewhat inebriated when attempting that sentence. The Chairman asked whether we were quorate. No-one said much to that being either unsure of what the current choir rate was or whether to admit to having been quarantined recently. A rather large number of starters, appetisers and the like were on display at the residence of the Chief Saladeer where most of the Committee commenced their deliberations. An even greater number of pistacchio nuts, however, lurked near bottles of wine in another room so they were duly dispensed with. One member tried to confuse things by replacing the opened shells in the same bowl as the unopened ones. Dishes included one entitled Lithuanian Aphrodisiac prepared moments before by the Minutes Secretary who appeared not to have succeeded in resigning after all and a wide variety of vegetables in varying degrees of dressing. Staggering across the road to the Chairman's domain in twos and threes took about twenty minutes where further supplies of fine wine and champagne were available and limited quantities of non-alcoholic beverages. Here members were treated to vast quantities of slow-cooked chicken, beef and other dishes plus another range of vegetables. A new member of the Committee created something of a stir when greeting a lady with the remark You've got legs! Now, normally this might have been perceived as bad form but he uttered the word legs! with such relish that the owner of the aforementioned blushed and appeared quite pleased and business resumed. It was noted that the owner of the legs had just reached a Notable Golden Age and there were several points of order, punctuated with Cheers, Toosoo! and request that the Member give a speech for she was a jolly good fellow or a similar combination of those words. Thanks were recorded for the super efforts of the Member for Arts in providing suitably irreverent and immensely entertaining posters to mark the Leg Member's achievement. Presents were opened at the first venue and cake candles lit at the second. The procedures for cutting the cake had to be dispensed with on this occasion as the device for said cutting, which might have resembled a slice did in fact bear more resemblance to a substantially different type of device for which totally new instructions would need to be consulted. The handle bore several buttons. Pressing one produced a noticeable vibration accompanied by an approximation to the Happy Birthday tune only one of which was particularly pleasurable. Other button-pressing brought further vibration and variations on the celebratory theme. Some twenty minutes passed while Members regained their composure and witnessed the obligatory destruction of a delightfully decorated gateau. There was some discussion as to exactly how the Member with Telescope had assisted the Chief Saladeer with the creation of an extract from the sheet music for Happy Birthday (fortunately now out of copyright) including accurate treble clefs. During consumption of the main course the Member with a Maths GCSE assisted the Minutes Secretary and the Member with Telescope in their impression of Bookends. There then followed a batch of quizzes designed to assess members' knowledge of carol titles, new year around the world, pirate actors and their ability to listen. It was unanimously agreed that the Chairman's Wife had excelled herself not only in the production quality of the handouts but also in the amalgamation of such a bizarre group of topics. The Station Master excelled himself by recognising 100% of the pirates but other members failed miserably in the tests of their knowledge. Particular noteworthy was the performance of the Member with a Maths GCSE who proceeded to ask Can you read that again? on each occasion that the QuizMeister announced Listen carefully - I shall say this only once. No-one thought to mention 'Allo 'Allo but the occasion was almost as funny. The Member with Legs asked whether any Committee Member wished to share their New Year's Resolutions. Being late on January 1st all Members succeeded in pretending to have forgotten them, fearing it being found out that they had failed to honour commitments of about 22 hours earlier. Whilst some Members feigned inebriation and others deafness, all were relieved that the Member with Legs didn't press them further. The highlight of the meeting was the switching on of The Chocolate Fountain. There was some mumbling about something being smaller than some had expected which may or may not have been a reference to the device but all conversation ceased abruptly as the moment of switch-on arrived. Consulting the instruction manual, the Chief Saladeer pressed the electric switch and immediately there was a tremendous whirring and wobbling as the structure of the device rotated in a decidely dodgy fashion for a minute of two. White chocolate and brown chocolate were drawn up the central tube and for a moment it was thought that this might be the very first sighting of striped chocolate in England. However, a slightly lighter brown sludge appeared at the top, courstesy of Mr Archimedes and his screw, and splodged pleasantly down three dishes that formed the fountain platters. Mercifully, at this point the wobblying ceased and chocolate flowed evenly and the thing stabilised. Members grabbed their melons and other accoutrements and approached the descending choc with their prongs outstrectched. After a quick twirl in the mixture and leaving a trail of melting Belgian across the tablecloth there was much yumming and generally approving noises made. 2008 had well and truly begun in style. Well, we wouldn't have had it any other way, now, would we! Finally managed to get my hands on the 'Astcote train' movie. Hold tight!